I think by now those of you who have been coming to Just Us Girls and reading our reviews and entering our giveaways know that my family is a huge fan of The Howard B. Wigglebottom Book Series. 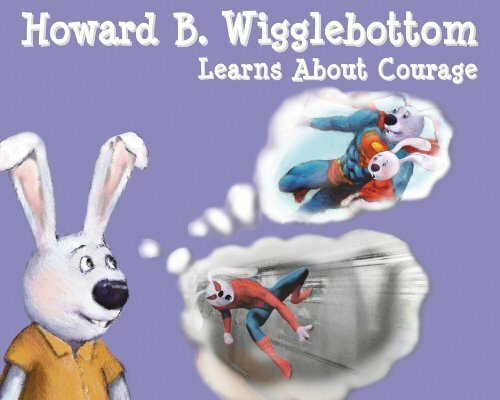 So it shouldn't be a surprise for us to share with you our thoughts on the latest book where Howard learns about courage. In this latest book, Howard goes through a tough time and is basically scared of everything, from strangers, insects, loud noises, but mostly his first day at a new school. He doesn't want to play with any of his friends, he doesn't want to go outside because he's afraid something bad will happen to him. That is until he meets a little bird trying to learn to fly for the first time. Talking to the bird, Howard learns that the bird along with even Super Heros have fears and are some times scared, but that it was okay. That's what makes them brave and doing something you're afraid of gives you courage. Like all the other books I've read from this series, I loved this one as well. Not only is this teaching our kids that trying something new is okay, but it's teaching them that being afraid is okay too and that they aren't the only ones. My son loved this story particularly I think it reminded him of his first day of school. He was nervous, but once he got there he was okay. Like always you can find out how to purchase any of the books from this series by visiting their website and while you're there you can browse around and let your kids browse around as well since they have animated stories, songs and so much more for your kiddo to do.